Some car enthusiasts worry that EVs represent the death of something in the automotive spirit. Let me try to convince you why that won’t happen. 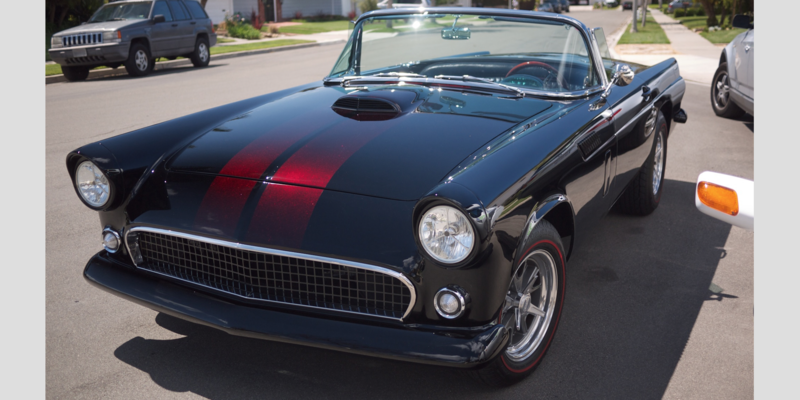 My father is a “car guy.” He has a ’56 Ford Thunderbird which he personally restored and modified himself. It has the original 292 engine – not the 312 from the ’57s – but he bored out the cylinders to make it a 327 and slapped three 2-barrel Stromberg 97 carburetors on it. All the chrome is blacked out, the continental kit is missing (because the rear end was donated from a ’55 after the original ’56 has a rear collision), and it has a bitchin’ paint job with dark maroon ghost racing stripes, which never fail to surprise people and attract comments at the many car shows he attends. He also had a MINI E – one of about 500 made, the predecessor to the BMW ActiveE that was then the predecessor to the BMW i3. The car was a prototype for a prototype, not ready for primetime, but still a great little car – his favorite car of any he’s ever had. If he could have kept it he would have, but unfortunately the program was lease-only and BMW only wanted to use the car as a pilot program for their “i” division. Back in 2009-2011, he would take the MINI E to car shows, and encountered a fair amount of skepticism from assorted gearheads, even here in Southern California, the land of EVs. Now in 2016, among his group of six Ferrari, Mercedes and Porsche-owning friends who meet every weekend at the local Cars & Coffee, three of them have Fiat 500Es which they love, and my father has two Model 3 reservations. What am I getting at with all this? It’s possible to be an old-timey, fume-sniffing, roaring exhaust “car guy” and still appreciate the performance, comfort, convenience, and environmental aspects of electric vehicles. There’s lots of guys like my father out there. Drag racing legend “Big Daddy” Don Garlits has an electric dragster. Gentleman racing driver Lord Drayson has an 850hp LMP-style electric racing car (which racing driver and automotive journalist Chris Harris quite liked). Jay Leno owns just about every car out there – including a ridiculous car built around a tank engine – but also “gets it” when it comes to electric cars, as he has a 1909 Baker electric car and generally reviews EVs very positively on his “Jay Leno’s Garage” show – particularly the Tesla Model S, one of which he owns. He often makes the same point – why waste gasoline to drive to work or take your kids to soccer practice in your unexciting 4-cylinder Camry when you could use electricity for the same purpose (and have a better time of it anyway), and save the gas to fuel your classic Hemi ‘Cuda when you need it for nostalgia reasons? Jonathan Ward, an “icon” of no-compromise bespoke automotive design recently partnered with Zelectric to make an electric VW Thing, and is working on an electric-powered ’49 Mercury as part of his resto-modded “derelict” series. Christian von Koeniggsegg, builder of insane hypercars, including several iterations of the “fastest car in the world,” owns and loves his Model S, which he bought because it was the “most practical, most sporty, most fun to drive” car available. He expects electric cars to become the dominant form of transportation in the future, with internal combustion engines remaining useful primarily for super sportscar/enthusiast niches. He even specifically said that the Model S is better than an M5. Even Bob Lutz occasionally musters nice things to say about EVs, having credited pressure from the Tesla Roadster as the reason for the Volt’s existence. The same is true in the other direction – electric car guys can be regular car guys as well. Elon Musk used to own a McLaren F1, probably the all-time pinnacle of a “driver’s car,” Franz von Holzhausen, Tesla’s chief designer, previously worked with Mazda and GM, and the staff at the Tesla design studio are “all car guys,” as Motor Trend recently found out when they stopped by with a Bolt EV. I had a similar experience back in the day, when I stopped by there with the aforementioned MINI E, and all the design studio employees dropped what they were doing and came outside to swarm around one of the first EVs driving on public roads in the US. The list is really quite long. And all of these “car guys” are enthusiastically accepting the present state of automotive technology, and enjoying driving EVs more, not less, than old internal combustion technology vehicles. Unfortunately, one of the few car guys who doesn’t “get it” happens to be one of the loudest, with one of the largest megaphones: Jeremy Clarkson, who’s back in the public eye, displayed his ignorance in a recent interview, rolling out various long-ago-debunked and/or completely made-up talking points about electric cars. He’s had plenty of opportunities to learn since the infamous Tesla Roadster review, where he had great things to say about the car until he faked a breakdown and stated that “it doesn’t work” (my 2008 Roadster seems not to have gotten the memo, since it works quite well). He’s done various reviews of EVs and PHEVs over the last several years, including hamming it up and feigning difficulty charging a BMW i8 and his very wrong prediction about the battery life of a Nissan Leaf. So who knows why this one car guy in particular seems to be beyond help. But if you’re a car guy, or you know some car guys who are skeptical of EVs, take a page from the examples of the many other car guys above and give an EV a try with an open mind. I think you’ll find, as so many have, that EVs provide an excellent driving experience. You won’t have to give up anything you love, and you just might end up loving something new as well.